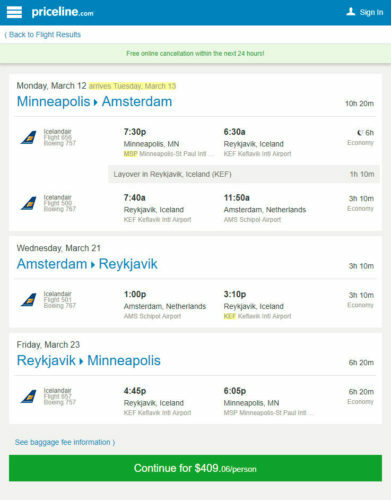 Visit both Amsterdam and Reykjavik with this fare. 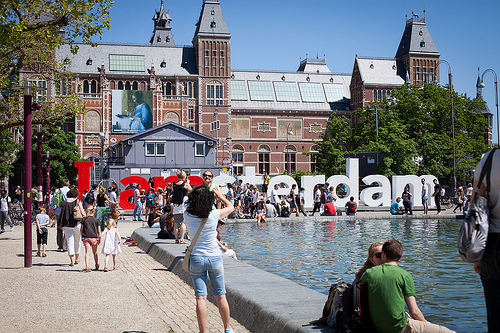 You can visit Amsterdam with or without the stopover in Reykjavik. With the stopover, prices are $409. Without the stopover, $395. 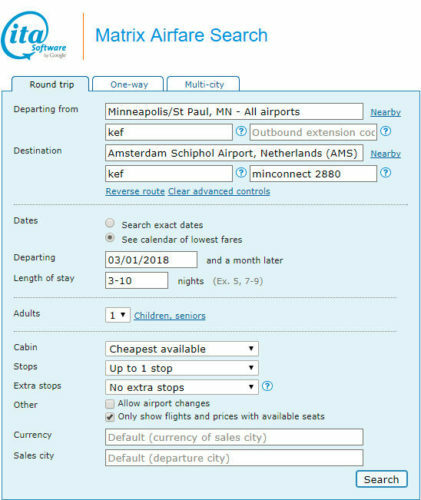 Valid for travel in mid-March 2018. Must purchase at least 1 day in advance of departure. The “2880” after “minconnect” instructs ITA to search for a connection of at least 2,880 minutes (48 hours). ITA will start to error out once that number is greater than 4,020 though longer stopovers are still possible. Using the result as a guideline, play with the stopover length on Priceline’s multi-destination feature to see if the fare prices correctly. It will be a trial and error process. The stopover can either be on the outbound or return segments. If you want the stopover on the outbound, input “minconnect 2880” into the Outbound Routing Code field instead of the Return. Then put “kef” in the Return Advanced Routing Code field. Icelandair is an Alaska Air partner. Mileage earning with Alaska Air is below.